New Delhi : A consortium of crop-industry specialists today released a report to challenge what it says are the myriad myths and misconceptions about Indian agriculture widely prevalent among the public. The report’s authors from the Mumbai-based Centre for Environment and Agriculture and the Tata Strategic Management Group say they have used “facts and figures” to question these myths that range from trends in India’s agricultural performance to the promise of organic farming to “injections” of chemicals into fruits and vegetables. “A negative narrative has been built around agriculture – and we want to correct this,” said Shanmugam Ganesan, an agronomist adviser to the Crop Care Federation of India, a crop-care industry association. The report lists figures to debunk what it says are popular but misleading notions such as Indian agriculture dominated by grain production or crop protection chemicals were hurting the aquatic ecosystem. Ganesan said myth number one was that Indian agriculture was in permanent decline. In reality, the report says, Indian agricultural production increased from $87 billion in 2004-05 to $322 billion in 2015-16, marking a 12.6 per cent annual growth rate. Myth: Indian agriculture is food-grains centric. Reality: Fruits, vegetables and animal husbandry contribute to 60 per cent of India’s agricultural GDP. India is the world’s largest milk producer, the second largest producer of fruits and vegetables, and the third largest egg and poultry producer. Myth: Declining size of Indian farmland leads to low production. Reality: Globally, the size of farm holdings less than two hectares is 84 per cent compared to China’s 98 per cent, and India’s 72 per cent. Despite low farm sizes, India and China are the world’s leaders in agricultural production. Myth: Indian agriculture is heavily dependent on rainfall. 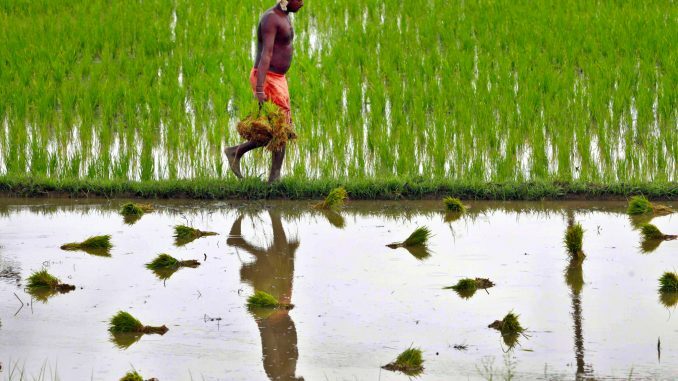 Reality: Indian agriculture is more monsoon-resilient than assumed. India has the world’s largest area under irrigation. Over 70 per cent of wheat land and 59 per cent paddy in India are irrigated. Eight top horticulture crops grown in India also have high levels of irrigation. China and the US with lower precipitation (rain and snow) are among the world’s top agricultural producers. Myth: Organic farming can drive sustainability in Indian agriculture. Reality: Globally, only 1.1 per cent of land is under organic cultivation. Organic farms at times have crop yields 20 per cent less than conventional farms. In India, organic farm production declined from 3.8 million tonnes in 2011 to 1.24 million tonnes in 2014. If all farms switched to organic farming overnight, food production would drop, and threaten food security. Sikkim has been touted as an organic farming state. But while Sikkim’s population has increased by about 50 per cent over the past decade, its food grain production decreased by 30 per cent. Sikkim has the lowest productivity (5 tonnes per hectare) vegetables in India. Myth: India uses excessive crop protection chemicals. Reality: India’s spending on crop protection chemicals is less than one per cent of its total agricultural production in value. India’s per hectare crop protection chemicals is about 0.4kg per hectare compared with China’s 17kg per hectare, Germany’s 3.7kg per hectare, or the UK’s 2.8kg per hectare. Myth: Crop protection chemicals lead to imbalance in the aquatic ecosystem. Reality: Two-thirds of India’s fish production comes from inland sources. Fish production from inland sources steadily increased from 2.85 million tonnes in 2001 to 6.93 million tonnes in 2015. If crop protection chemicals had polluted inland water, large-scale aquaculture would not have been possible. Myth: Fruits and Vegetables are injected with colouring chemicals and hormones. Reality: Injecting liquid inside harvested fruits or vegetables would alter the “internal equilibrium” of the fruits or vegetables and spoil them. The vascular system in plants ceases to be functional in harvested produce and any chemical dye injected will not spread through the fruits or vegetables. Source: Report released by the Centre for Environment and Agriculture, Tata Strategic Management Group and trade body Assocham, India.